1RN, MSc, PhD, Professor of Nursing Department, TEI of Larissa. The relation between the bronchial asthma and psychological factors was first observed in the remote past. A series of clinical observations suggest that the asthma and stress are closely related to one another [1-5]. The asthma, as a chronic illness, has his own psychological dimensions. In the other hand, the mental situation of individual affects his bodily health and determines many times the course of illness. In the case of asthma a common genetic substrate with the psychiatric diseases observed in the families of asthmatic is possible, making thus the psychiatric background of individuals and their families a critical parameter for the symptoms and the course of bronchial asthma [4,5]. The research of psychological factors today acquires particular importance as the traditional environmental factors that are considered responsible for the illness do not explain satisfactorily the increased prevalence of the diseases in the last years. On the other hand, the two last decades has become explicit the importance of neuroendocrinology system in the development of diseases in which the process of inflammation plays fundamental role, as e.g the rheumatic diseases. The research in this field is expected to lit up more the pathogenesis of asthma and his relation with the central nervous and endocrinological system [4-6]. 1148 individuals took part in the study. A random, stratified sample of high schools in urban and rural areas of the region of Larissa as well as a sample of TEI students with 1148 students in total was chosen. Closed –type Questionnaires were used for data collection. 626 students finally responded (response rate 54.5%). Some students did not answer all the questions (age, current asthma, or the part referring to depression). As a result the final number of questionnaires were not the same in all the cases. These partially completed questionnaires were included in the study, in order not to loose information. Estimation of asthma : The questionnaire ECRHS was used modified, of phase 2, its short version . It comprises 10 questions and is used as a screening test. Estimation of psychological status (anxiety & depression- questionnaire DSSI/sAD) : The questionnaire DSSI/sAD of Bedford and Foulds [7,8] examines symptoms of stress and depression. It comprises fourteen questions, seven regarding to stress and seven to depression. It can be used as a screening test, in order people who present with psychiatric symptoms to be identified, but also as indicator of the severity of the symptoms of stress and depression. It provides a simple and fast level estimation of the stress and depression. It exclusively focuses on the current symptomatology without being related with the structure of personality or other components. A questionnaire like that, which examines also the stress and the depression it seems as the most suitable for research in the patients, since it is already known that these two entities are examined together. The total sum for each scale (stress, depression) is the sum of results in the individual questions (breadth from 0-21). The critical sum for each category of is 3. Eighty two per cent of the general population give result under 3 and they have to be considered free of symptoms. Eleven per cent are moved between 3 and 6 and it is considered that they present some form of marginal psychiatric symptomatology, while seven per cent are found above 6 and it is considered that they present serious phychopathology. These individuals from psychiatric viewpoint could be also considered as patients. Statistics : Coding and Treatment: Initially the variables were coded, according to their order of appearance in the questionnaires. Derivative variables were also created with corresponding coding, as properly e.g. K2 for the moderate symptomatology in the scale of depression, K3 for serious symptoms etc. Tables of frequencies were produced for the general epidemiologic characteristics of sample and for the characteristics of asthma of individuals that took part in the study. The data were examined then with tables of cross-correlation and were the corresponding constants of cross-correlation (contingency coefficient) for the qualitative variables were calculated. The Mann-Whitney-U-Test was also used for non-parametric distributions.. It is also advisable for quantitative variables, when these do not follow the regular distribution. The control of the latter was accomplished with the Kolmogorov-Smirnov test. The qualitative variables were examined with the use of x2 of Pearson with the correction of continuity of Yates, where they were necessary. The level of importance was 0,05. SPSS for Windows, 8.0 version was used for statistical processing. 31,1% of the students were males and 68,9% females. The epidemiologic characteristics of the sample appear in table 1. The medium age was 18,9 years. The frequency of asthma amounted finally to the 9,3%, while the asthmatic crises the last year (current asthma) amounted to the 3,4% (table 2). 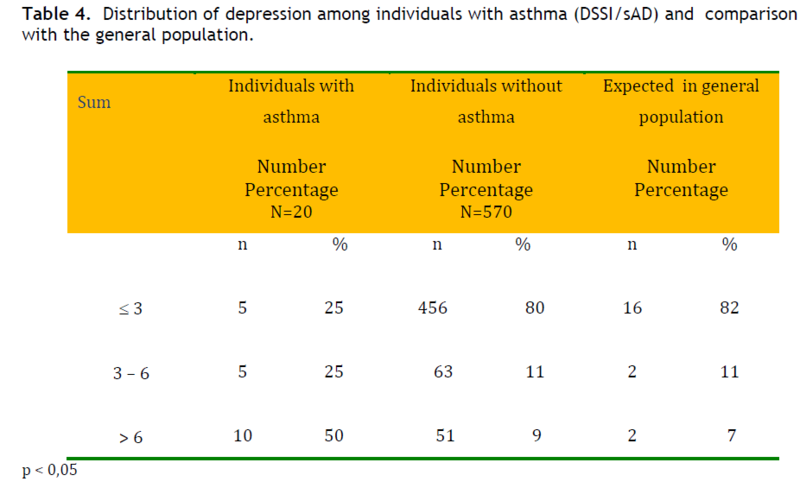 The distribution of stress and depression in the individuals with asthma and their comparison with the expected percentages in the general population appear in the tables 3 and 4. 75 % and 50 % of the students with asthma scored above 6 in the anxiety and depression scale respectively, whereas percentages in non-asthmatic children were 12% and 9% respectively, close to those percentages observed in the general population. The difference was statistically significant as showed in table 5, where the comparison as for the grades (score) between individuals with asthma and individuals without asthma regarding anxiety and depression is presented. The frequency of asthma that was determined in the present study was 9,1%, a rate close to what international studies report the last years . The frequency of children's asthma in Europe ranges between 7% and 11%. The frequency of wheeze, as well as asthma they have increased regularly the last 30 years. It was found that this increase in the frequency of asthma was much bigger that of wheeze [10,11]. This strengthens the point that an important reason for the increase of frequency exists and the term “ asthma” appears more frequently, in contrast to terms “asthmatic” or “allergic bronchitis” that was used in the past. It is truth that great differences are observed in the frequency of asthma among various regions, as well as in various studies . The different methodology and the criteria that are used are accountable to an extent for these differences. However, it seems that beyond the recognition of this illness and the whichever problems in methodology, and real increase of incidents exists as well. In Hong-Kong, the frequency of asthma was increased at 71% and the wheeze at 24% in a few years . In Finland an increase of asthma was observed in the recruits from 0,08% in 1961, to 0,29% in 1996 and to 1,79% in 1989. If the increase of incidents is attributed only to the fact that the diagnosis of asthma is established more often, should be supposed the 95% of incidents before 1966 to have slipped the right diagnosis . Other studies that became the last two years certify the continuing increase of frequency of asthma . In the United States the frequency of asthma has been increased from 3,1% in 1980 to 5,4% in 1994, but the frequency of illness among the children of poor families is considerably bigger . The declining course of frequency in crises relapse agrees with the more general favourable forecast of asthma as the patient grows up. Similar findings are reported in a study in the Great Britain and refers to children that were kept under observation from 7 up to their 30. The percentage of children that continued presenting episodes in the age of 17 years were 18% . Similar were also the findings of epidemiologic research that held in Israel and included the study of large number of boys and girls of age of 17 years. These children were examined by doctors in order to join the arm forces of their country. All children that presented symptoms of asthma or reported similar symptoms in their background, were examined by experienced pneumologists and they were submitted in functional tests and challenge tests. Thus it was found that in the age of 17 years, the 77,3% of asthmatic boys and the 80,2% of asthmatic girls were free of asthma symptoms. That is to say, roughly 2 of the 10 children continued presenting symptomatology of asthma . In Greece the prevalence of asthma in the age of 13-14 years and in asample of 2.561 children was estimated at 5% approximately ( ISAAC study), of the lowest numbers internationally . Regarding Asthma and psychological factors, the research showed high prevalence of psychiatric symptoms in the adolescents and young adults. Stress in the family and background of affective disorders are reported in families with asthmatic children. The dysfunction of family and psychological troubles of the mother are combined with high morbidity of children with asthma . In the relatives of adolescents with asthma, the proportion of incidents with depression, mania , substance abuse and antisocial personality was high enough. The chronic illnesses as asthma turn out to be a source of stress for the family, a fact that could burden seriously its function, specifically when the family is in bad socio-economic situation . It is also interesting the fact that children with asthma brings about more problems even when they are compared with children with diabetes. 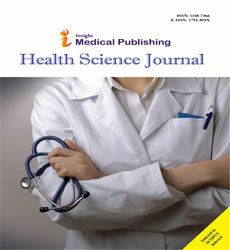 In a research that was held in 93 children with bronchial asthma of moderate severity, it was found that the children presented in a larger percentage psychiatric symptoms, mainly anxiety disturbances, compared to children that suffer from juvenile diabetes, illness that is considered that causes increased requirements from parents and children . Most studies deal with moderate or very severe asthma [20,21]. Ηowever, even in patients with mild asthma, psychiatric disturbances persist . The stressors contribute to the deterioration of illness and a lot of evidence suggests a relation between stress and the deterioration of function of immune system particularly in animals . It seems that a biological - genetic link between the asthma and the psychiatric disturbances may exist, beyond the indirect relation via the psychological pressure. Perhaps there is a common pathogenetic backround that renders asthmatic people vulnerable to mental illness. Beyond their likely role in the pathogenicity of illness and in the deterioration of illness, the emotional and stress disturbances are considered an obstacle in the treatment of illness. According to Rietveld et al.,  early assessment of emotional problems is a matter of great importance.When the patients arrive with atypical symptoms or they correspond insufficiently in the treatment, then the doctor has to suspect functional - psychological troubles. A psychiatric estimation could confirm confirm these problems. If the asthma coexists with a stress disorder, the confrontation of asthma comes first, because at least in the beginning, the asthma crises may cause panic events. On the contrary, if the asthma coexists with depression, the confrontation of depression takes priority, because otherwise the confrontation of asthma has been proved that it is not satisfactory . Based on above, the study of the psychological factors, can be applied in an individualized, as well as in a mass level. In the case of the patient, the psychological charge is initially appreciated using specific questionnaires as are the questionnaires of Beck, Bedford and Foulds et al. [8,25]. If the stress is prominent, a period of follow-up takes place, in which we expect clinical response in the antiasthmatic treatment and then the level of stress is revaluated. In case where the psychiatric symptomatology persists, reference to an expert is recommended. In case the symptoms of depression are detected, immediately confrontation is consisted. In every case the parents of child should be subjected to psychological evaluation. In a mass level , the study of the psychological parameters of illness can be applied in schools, called asthma schools, where the parents are informed for the contribution of stress in the appearance of symptoms. This research has a few weak points. The most important is the losses in the collection of questionnaires. The implementation of directives of Ethical Committee of Pedagogic Institute for parents’ consensus in writing (due to protection of personal data), but also each parent to read the questionnaire at home and fill it there, had as a result the increase in the time of completion - return of questionnaires that it reached a week, but also increased losses. It is noted also that the directors of schools asked to fix as day of collection the end of the week, in order not to disturb the teaching hours any further. An innate disadvantage of protocol was that it did not include confirmation of diagnosis from the notebook of health of student. It was estimated that this would impede more the collection of data, while it would probably lead to unreliable conclusions, if there was not direct communication with the personal doctor of the student. Under the given conditions of the function of the National Health System in our country and without the institution of familial doctor, such an approach was excluded. It was estimated that it would meet insuperable difficulties. Also the final composition of sample included 31,1% of men, mainly because the few men attend the Nursing Departments. Many parameters and possible faults should be taken into consideration in this study. The answers of parents that referred to family medical history they were probably unreliable. The asthma often is confused with illnesses as the chronic obstructive lung disease or heart failure. Also, many did not know that terms as allergic or spastic bronchitis are synonymous with asthma. Still exists the possibility that the answers given were not sincere deliberately, because there is a bias in the severity of illness. Perhaps some of the individuals considered some of the questions excessively personal and they did not answer them frankly. Finally, due to the small sample size of students with asthma no definitive conclusions can be drawn. The findings of the present study underlines the important role of the psychological environment in the evolution of asthma and the psychological burden of individuals with asthma. The degree of correlation of asthma and psychopathology in sufferers, suggests a common link between asthma, the Central Nervous System and the psychological disturbances. At the same time, the augmentative tendency in the incident of asthma during the last years is confirmed. Pearce N, Weiland S, Keil U, Langridge P, Anderson HR, Strachan D, et al. Selfreported prevalence of asthma symptoms in children in Australia, England, Germany and New Zealand: aninternational comparison using the ISAACprotocol. EurRespir J. 1993Nov;6(10):1455-61. Leung R, Wong G, Lau J, Ho A, Chan JK, Choy D, et al. Prevalence of asthma and allergy in Hong Kong schoolchildren: an ISAAC study. EurRespir J. 1997 Feb;10(2):354-60. Haahtela T, Lindholm H, Biorksten F, Koskenvuo K, Caitinen LA. Prevalence of asthma in finnish young men. BMJ 1990: 301:266-301. Sly RM. Changing prevalence of allergic rhinitis and asthma. Asthma Allergy Immunol: 1999;82: 233-48. Burke C, Power CK, Norris A, Condez A, Schnekel B, PoulterCW.Lung function and immunopathological changes after inhaled corticosteroid therapy in asthma. EurRespir J. 1992; 5:73-79. Godfrey S. Natural history of childhood asthma. In Clark TJH, Godfrey S and Lee TH ,eds. Asthma,3rd ed, Chapman and Hall, London 1992: 559-563. Morey PJ, Jones K. Past maternal experience of asthma. Childhood morbidity and the psychosocial impact of the disorder. J Asthma 1993;:30:271-6. Hamlett KW, Pellegrim DS, Katz KS. Childhood chronic illness as a family stressor. J PediatrPsychol 1992: 17: 33- 47. Vila G, Nollet-Clemenson C, Vera M, Robert JJ, de Blic J, Jouvent R, et al . Prevalence of DSM-IV disorders inchildren and adolescents with asthma v. diabetes Can J. Psychiatry 1999: 44:562-9. Yellowlees P, Haynes S, Potts N, Ruffin R. Psychiatric morbidity in patients with life threatening asthma: initial report of a controlled study. Med J Aust 1988;146: 246 ? 249. Fritz GK, Rubestein S, Lewiston NJ. Psychological factors in fatal childhood asthma. Am J Orthopsychiatry 1987; 57: 253 ? 257. Krommydas GC, Gourgoulianis KI, Kotrotsiou E, Raftopoulos V, Molyvdas PA: Depression and pulmonary function in outpatients with asthma. Respiratory Medicine 2004;98:220-22.